Everyone knows English social care is in trouble financially. This BBC story sets out the background, and we made a short video which explains it in more detail. In a nutshell, Councils are caught in a pincer movement between growing needs and reducing resources. Shortly after the global financial crisis of 2008, graphs like the one below started doing the rounds. The response of local authorities has been to cut spending by (almost) any means possible, and ‘sustainability’ has often become by-word for cost cutting. I believe that this is wrong. Whilst some degree of cost-cutting has probably been inevitable, in many ways it has moved us further away from sustainable care rather than closer to it. In this short post, I want to explore the impact of ‘simple’ cost-cutting and suggest some alternatives. Firstly, it may be useful to look at what is meant by ‘social care’. Over the last 7 or 8 years it has come to be been to be thought of as a unit of labour that can be delivered by almost anyone, preferably for as little money as possible (see this excellent article by Lewis & West for a much longer explanation — pay wall in force). This has gone hand-in-hand with a reduction in the number of services directly commissioned by Councils, and a corresponding increase in the purchase of care by the hour, often from for-profit agencies. The hourly rate that Councils will pay is fixed, and has been reducing as a result of austerity. The impact of this on the workforce has been profound. Many people who were happy to work p/t for charities with a stable (and often appreciative) client base are not interested in participating in the new ‘market for care’. Many Personal Assistants (PAs) are employed by agencies that cannot guarantee a full week’s work. They are sometimes expected to pay for their own travel, or sit around (unpaid) between visits. People leave frequently, as better paid work is easy to find. It’s not rare for people who use the services of PAs have to put up with a troupe of strangers coming in and out of their homes, often to perform intimate personal tasks. PAs no longer have enough time to stop and chat, or form the relationships that once made this type of work rewarding and helpful. So, cost-cutting is making it less like the care people want to be providing, and less like the kind of care people want to receive. There‘s been a similar impact on care provided by people who are professionally qualified. Local authority social work is increasingly being defined in terms of ‘statutory interventions’ — using the compulsory powers available under for example the Children Act 1989 and the Mental Health Act 1983 to impose solutions people can’t or won’t consent to. This kind of intervention has always been a part of the care system, and since the 1990s, an increasingly prominent feature of local authority social work. My own impression is that most social workers broadly agree it’s necessary, and make in-depth, situation-specific ethical judgements about whether they’re prepared to do it. A part of that judgement will be about whether the uses of legal authority are ultimately going to be in people’s best interests. A factor in this is the support and services that will be available to people once they’re ‘in the system’. As an example, consider a man in mental distress who is at risk of suicide. Admitting him to hospital against his will may seem a justifiable to save his life. However, it’s unlikely to be justifiable in the same way if the power is used to admit the man to a hospital is 200 miles away when he would have gone into the local hospital as a voluntary patient. In mental health services, it’s easy to get the impression that statutory powers are increasingly being used for bureaucratic convenience — to whip people into hospital when community services have been closed, and force them to comply with medication regimes on discharge. The recent increase in caseloads and focus on short-term risk management is also stressing social workers and preventing the kind of long-term partnership that service users find useful. Again, approaches to managing cost pressures are resulting in the kinds of ‘social care’ that don’t feel right for the provider or the recipient. What I’ve argued is that whilst cost-cutting may be seen as the only way of maintaining a service, it is actually counter-productive. Financial necessity is putting service users and service providers in situations where their interests are increasingly conflicting with one another. This is partly a product of the ‘market’ reforms introduced by a series of governments with the aim of driving quality up and price down. From a market theory perspective, one problem is that state-funded social care is usually purchased at a fixed price, which has been falling in real terms since 2009. This distorts the market in an unhelpful way. Usually in a ‘seller’s market’, high quality providers can charge more for their services, but because the price is effectively fixed by the local authority, this doesn’t happen. They can’t compete on quality, so they have to compete on cost. There are similar problems in care homes, which have historically been a high volume, low margin business. In 2011 a relatively small fluctuation in demand pushed the UK’s largest chain of care homes into insolvency. The new requirement for local authorities to ‘manage the market’ introduced by s.53-s.57 of the Care Act 2014 is supposed to help manage these risks, but the large percentage of providers exiting the market (estimated at 24%) suggests that it isn’t working successfully. So, cutting costs is reducing quality and capacity. Not very sustainable. It seems that neither free market mechanisms nor ‘command economy’ approaches to reducing costs are able to offset the inherent problems of cost-cutting. So is there a solution? According to Paul Pierson, writing well before the global economic crisis of 2008, austerity is a policy response of many affluent ‘welfare states’ to their initial over-commitments (free healthcare at the point of delivery, state pensions, free education etc.) and a global slowdown in economic growth. Given the popularity of state co-ordinated welfare, Pierson believes it’s unlikely to be ditched completely, resulting in what he describes as ‘permanent austerity’. Cost-containment is one austerity strategy used by governments, but there are others; re-commodification (starting to charge again for things that used to be free), and re-calibration (renegotiating what the state will provide). Some social services have always been charged for. The Care Act 2014 gives local authorities extensive powers to charge, and the government has also recently allowed increases in Council Tax as a ‘social care precept’. However, taken together with the cuts to local government grant, the funding gap is still widening. One of the original aims of the cap on care costs that was going to be introduced by the Care Act 2014 was to reduce the uncertainty about the state’s commitment, making it easier for private insurance companies to offer products (p.32). 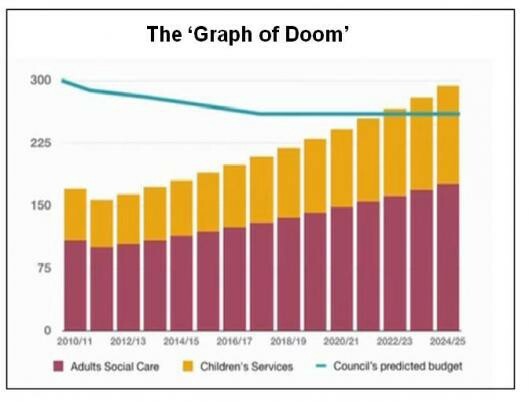 However the cap on care costs has now been deferred until 2020, and capacity continues to decline. Re-commodification will not fix the current problem. Re-calibration can be seen in terms of what are sometimes termed ‘new social risks’. Applied to social care, one could argue that the current system grew up out of the second world war where the greatest social risks were linked with homelessness, and support was always provided through residential services. The result was the ‘all-or-nothing’ solution of institutional care, and the new social risk was being ‘warehoused’ in relative comfort but without any way to participate socially or have a life. For the past 25 years we’ve been trying to get away from this, through policy goals such as community care and independent living, and active ageing. The idea is that people still need some level of resource from the state, but it needs to be re provided differently to do the things people actually want it to do. In the long-term this could actually save money. A great example here is Local Area Co-ordination (LAC). This idea starts by looking at what people want to do with their lives, not what’s wrong with them. Very similar to personalisation, then. Secondly, it looks at the strengths that people have and the contribution they can make, both as individuals and as a community. Very similar to the asset-based approaches to community development and the strengths perspective widely used on social work. Only if there are insufficient resources available for the person to meet their needs within the community will the Co-ordinator seek to call upon local statutory services or other supports. The argument is that this approach builds capacity within communities instead of eroding it, develops solutions that are more closely oriented to what people want (i.e. re-calibrated), and saves a lot of money. Recently a similar model seems to have been emerging within local authorities. As someone who watches these things, I’ve been interested to see a lot of similar descriptions of this kind of ‘innovation’ by Councils, usually in paid-for puff pieces attached to recruitment drives. Last week it emerged that this is no a coincidence and the new approach — now being described as the ‘3 conversations model’ — is the brainchild of Sam Newman of consultants Partners4Change. On the surface it’s very similar to LAC. Priorities are individually set, the assets of the individual and the community are considered before public money is spent, and long-term support is only considered as a last option. Apparently it’s popular with social care service users and professionals, as well as Councils. There have been no formal evaluations yet, but this may change next year. What could go wrong? The main risk in my view is that the expectation that costs are cut gets built into the model, and if it doesn’t work in the way that’s predicted, there’s no way back. There are plenty of examples of this happening in the very recent past. A good illustration is the ‘personalisation’ policy and personal budgets (PBs). These came about in the 1990s as a result of research commissioned by disabled people’s organisations, which showed that handing budgets over to disabled people as ‘direct payments’ would promote independence and choice, and also save money. Early successes of direct payments were followed by a much more ambitious programme of ‘Transforming Adult Social Care’ which was to see personal budgets become the default mechanism for local authority care spending. In 2008 the national pilot found no evidence that PBs cost-savings in the largest group of service users (older adults), but local authorities continued to assume they would. PBs were rolled out nationally between 2008 and 2011 with the aid of a fixed-term ‘transformation’ grant, which ended in 2012. It seems that the grant temporarily allowed Councils to balance the books, but this only made the shock worse when the money run out. Writing in 2014, Jenny Morris reported that personal budgets were by then being set at levels that did not give people any real choice over the supports they purchased. Earlier this year the Public Accounts Committee agreed that transferring assets from local authority contracts with providers to personal budgets was likely to make services worse not better if the driving motivation was cuts. Though welcome, this revelation has come far too late for many people, who now find that the day centres they once used have closed, and instead of living independently they are stuck at home. It’s too late to go back — the financial resource has gone and the infrastructure has been disassembled. If the models end up as over-optimistic cost-shunting, the money will still be there. If they prove viable over a reasonable period (say 10 years), then budgets could start to be tapered. My own view is that decent social care is worth paying for, and the real value that schemes such as LAC, and ‘3 conversations’ may have is in finding new spaces for people to support each other that aren’t dominated (and ruined) by money. I live in hope!